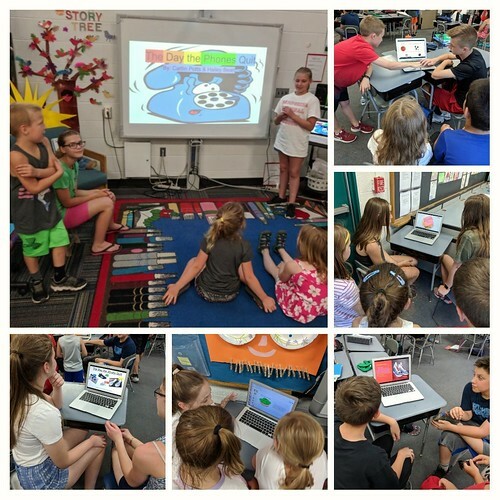 On our last full day of school yesterday (we still have today and tomorrow as half days), my librarian colleague, Pati, and I arranged to have our sixth graders share digital picture books with first graders, and it was a lovely experience to gather the older kids with the younger kids. Our sixth graders made their books this year in Google Slides, and the theme was to riff off the picture book The Day the Crayons Quit. Although we all felt rushed by the end, with not enough time to do everything that needed to get done, the sharing was a success. I am grateful for colleagues like Pati. It was all about writing for an audience, collaborating with a partner, understanding the design of image and words, and creating something worth sharing to younger readers. Pati and I have done versions of this project now for the past few years. Author/teacher John McPhee uses words I’ve never even known existed. His vocabulary boggles the mind. I wish I had kept a list of all the words in his book on writing — Draft No. 4 — that I didn’t know but now wondered about, and yet, I kept on reading instead of stopping to dig out my dictionary to look the words up. It didn’t matter. I navigated through, like sitting in the classroom of a professor whose intelligence and insights are washing over you, and you, not getting it all, know that much of it will stick with you. If not now, then later. I know McPhee’s writing through his work on long non-fiction in The New Yorker magazine. And I mean, long. He writes huge articles, sometimes spanning two editions on dense subjects. He spends months, if not years, on a single piece of non-fiction writing. Alaska. Cargo boats. Oranges. Long-distance trucking. His topics are all over the place. 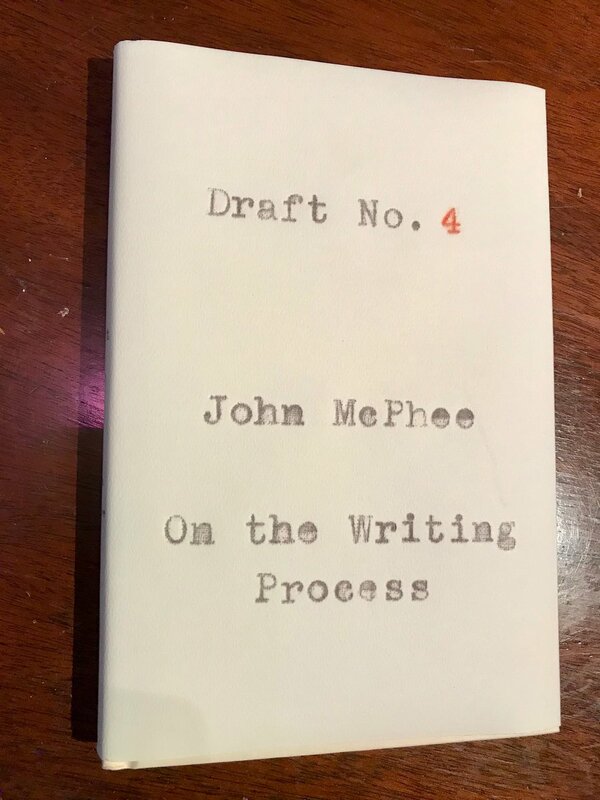 In this particular book on writing, McPhee finds interesting elements to explore about his chosen art form — from different and creative means to structure a long piece of writing (look at his diagrams when you get a chance and you’ll be amazed at his logic flow and systematic approach), to how fact-checking and editing still rule the day at magazines (or those of substance), to the frustrations of any writer trying to find a starting point that is elusive and slippery and then moving into the various draft stages (thus, the title). I’m going to tuck this book away with my other books on writing, and come back to it again, I am sure. McPhee (a professor at Princeton) has made me think, ponder and wonder about elements of the writing life. I’m still puzzling over some of his sentences and ideas, and that’s not a bad thing for a book on writing to leave you standing with. No, the “test” is not a standardized test. The “test” in This Is Just a Test, a novel by Madelyn Rosenberg and Wendy Wan-Long Shang is a nuclear bomb test. In this solid novel for middle school readers, set in the time of folks watching “The Day After,” we’re brought into the world of a character trying to make sense of a very confused world. David Da-Wei Horowitz, with a Chinese grandmother and a Jewish grandmother at odds with each other over cultural heritage, is prepping for his bar mitzvah as the world shudders in the face of Nuclear War. The television show “The Day After” sent ripples through pop culture (as I well remember) and David wonders when the world might end. The book has serious themes, but it is also a lighthearted look at a mixed-culture kid trying to find friendship and understanding, and finding ways to bring family together even in the midst of disagreement (the bar mitzvah surfaces tensions). Meanwhile, David is writing to another kid in Russia, a Jewish boy who will share in David’s bar mitzvah ceremonies from afar (since he cannot do it in the USSR). And he and a friend are building a bomb shelter, and debating the ethics of who gets to be invited in to the shelter. I wasn’t quite sure what to expect from this novel, and yet, once I was into the story, I really appreciated how the authors tackled such sensitive issues of culture, religion and global politics with grace and humanity. Maybe it helped that I was a kid during these same years of the story. The novel brings to light the Cold War fears of a generation (maybe not re-lit with the spats between the US and North Korea, and Iran). 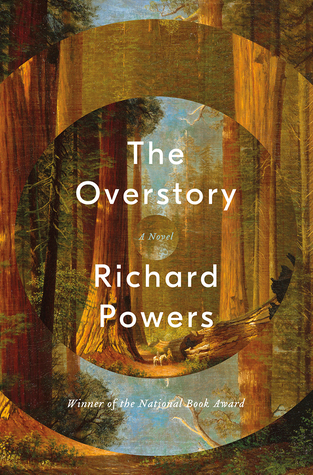 The entire first section of The Overstory by Richard Powers was pure magic. I was enthralled by the writing, as Powers sets up the “roots” of this story in character sketches of complicated people with complicated lives, all connected to the concept of trees and seeds and plants. I could not stop reading. The middle and ending of the novel are strong, but not quite as strong as the beginning. Still, Powers does an amazing job of weaving the science of trees into the narratives of human lives, and the places where all things eventually connect together. You come away from this novel with a new appreciation for the trees in your yard, or the forests where you walk, or the invisible architecture of what’s below the soil, keeping us all alive. There’s more than meets the eye, Powers tells us. I wasn’t quite satisfied with the ending, but I don’t know what I would have done different (not that I am second-guessing a talented writer like Powers). I anticipated more of a reckoning of some sort, of how people and trees are connected to this Earth, and how we share a common cellular ancestry. But maybe that was not his point. Maybe it was the illumination of all living things, and the notion that trees contain more than we can ever think to know. The May 2018 edition of the NCTE journal – Voices from the Middle — arrived in the mail and immediately caught my attention. It’s part of a series of “What’s Next” themed editions of the journal (an edition about what’s next in reading was intriguing), and this one is entitled “What’s Next? Digital Tools and Social Media” and, if you know me at all, you know that is something I am interested in as a teacher and a writer (and a parent). I was not surprised to Troy Hicks writing an introduction of sorts, as he framed the way technology is shaping our writing practices, and how our writing practices is shaping our use of technology. Yes, it goes both ways, and Troy has been writing and sharing and teaching us strategies about digital writing for many years now. (And Troy, thanks for the shout-out in your piece.) I was interested in the way Troy ended each section with an insight about digital writing, and what it means as we look ahead to teaching and writing. In other articles in the journal, I appreciated the exploration of digital imagery as a connection to understanding and uncovering the inner lives of our students, the strategies for battling the fake news phenomenon, how infographics might extend writing practices and the use of argument, and the way technology might open more doors for students of color to have a voice in the world. There are solid classroom examples, and lots of resources, to explore in these pieces. Overall, the theme from this wide range of writers and teachers is to remember that technology is a tool, not the thing. Students need to remain at the center of the learning and the writing, and educators — from the veteran teachers (like Chris Lehman’s piece about the imperative of pre-service teachers getting experience with digital literacies and Linda Rief’s piece about long-time teachers relying on students to teach us) — and the key to the work we all do to adapt to the changing world is, as the Cathy Fleischer notes, is “making this work sustainable” by connecting and sharing with other educators. You can access a few of the pieces for free at the NCTE site, but many of the pieces are in the journal that comes with being a NCTE member. Since Troy’s piece is open and free, how about joining me in using Hypothesis to annotate his column? 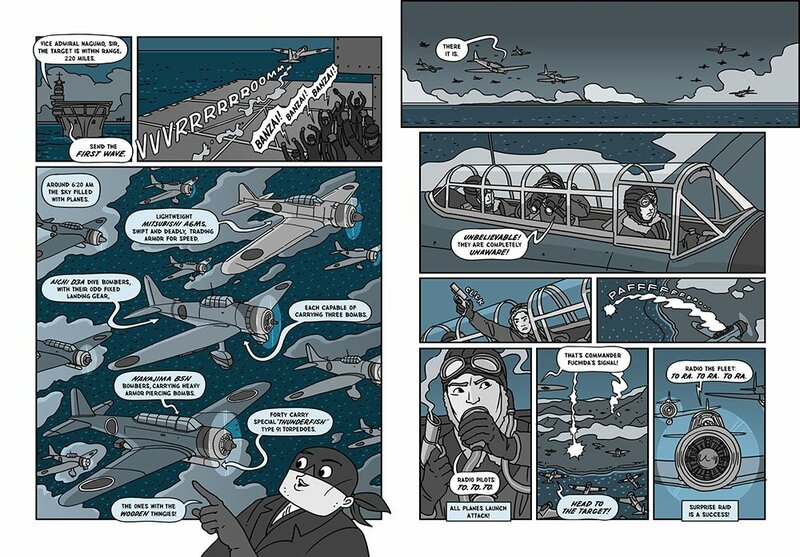 Another Nathan Hale’s Hazardous Tales by Nathan Hale (graphic novelist). Another tale, well-told. 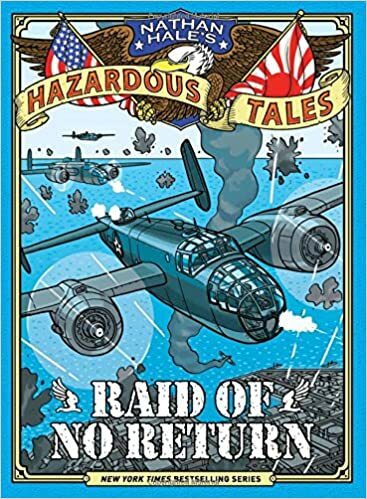 The latest in Hale’s popular series of non-fiction is entitled Raid of No Return, and it centers on the first mission by the United States after Pearl Harbor to bomb parts of Japan as WW2 began to escalate. As with the other books in this series, the story is deep with research and uses the intersections of comic illustrations with text in powerful ways. Here, we learn about the men who were part of the Doolittle Raid, who pushed their aircraft to extremes to strike fear into the hearts of the enemies at the time. This all stems from the attack at Pearl Harbor and the United State’s entry into World War 2. Actually, much of this story revolves around what happened after the raids on Japan, as the men of Doolittle’s squadron tried to get to safety when their aircrafts ran out of fuel or were shot down over Japan. To be fair, this kind of story could be retold from Japan’s side, with a different narrative view. Hale hints at the atrocities of war from both sides. The surprise bombings by the US did kill civilians in Japan, and Japan’s search for the pilots ended up killing 250,0o0 Chinese lives people (some of whom helped shelter the pilots and bring them to safety). I can’t even fathom that kind of destruction of reprisal. This book would be of interest to middle school and high school readers, although the dense and packed text and pages might make it a difficult read for some students. Hale does not flinch from the horrors of war in this book, but he also celebrates bravery and cunning and survival. The ending, which updates us on the men who survived, is heartbreaking in its emotional punch. I had enjoyed Peter Brown’s The Wild Robot quite a bit, as Brown spun a story of a future time and a broken robot that comes to live and survive and thrive on an island with animals, until it is discovered and taken back to the factory. The sequel — The Wild Robot Escapes — is also a solid yarn, where our robot, Roz, is back in action, but this time, she is trying to escape the farm where she works to get back to her island, and reunite with her adopted son, a goose named Brightbill. Brown writes these stories in declarative sentences, an effect that over the course of the novel really brings the character of Roz to life, as she uses her robotic abilities to help others, and to find her way back home. Repeated declarative sentences creates a mechanical rhythm of sorts, although Roz is anything but robotic. And Brown inserts a narrator voice every now and then, too, as a sort of counter-balance. The result is effective story writing. The world that Roz lives in one of our own possible worlds, where machines and robots and computers have become an overly integral part of the workforce, and where the tension between technology for good versus technology for bad plays out for Roz. I could see these books being a huge hit for elementary students, although I suspect The Wild Robot Escapes might be seen as a little young by many of my sixth graders (even if the story has enough complexities to engage readers of any age, with a nice twist at the end). The illustrations are interesting, too, bringing a sort of metallic charm to Roz and her surroundings. I’m always curious about interactive books, and since my students work on their own interactive fiction stories, I’m always on the look-out for more mentor texts for the classroom. This book — The Quest of Theseus — is a new series for me, but it seems as if it is part of a set of mythological heroes, with the reader having agency to make decisions about the actions and lead the story into different elements of the hero’s tales. Here, there are three main story paths (battle the Minotaur, go to the Underworld, or fight for the throne of Athens), with 39 different choices and 18 different endings. 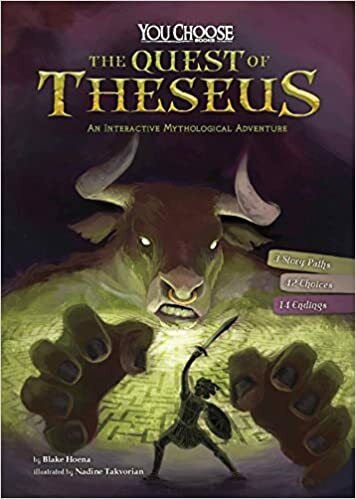 While the writing is so-so and the action could have been given a bit more excitement, this interactive book was engaging enough to bring the myths of Theseus alive, and has me wondering about if I might get a few copies for the classroom. Certainly, Theseus is one of the models for Percy Jackson, and we do cover Greek Mythology in the year. I see from the back cover that there are about seven more books in the series, including one for The Odyssey.